The basic configuration of a “conventional” wobbulator is shown below. The wobbulator generates a “saw-tooth” waveform which is used as the control input voltage for a Voltage Controlled Oscillator (VCO) and also as the external trigger voltage to control the time base (X direction)on the oscilloscope. 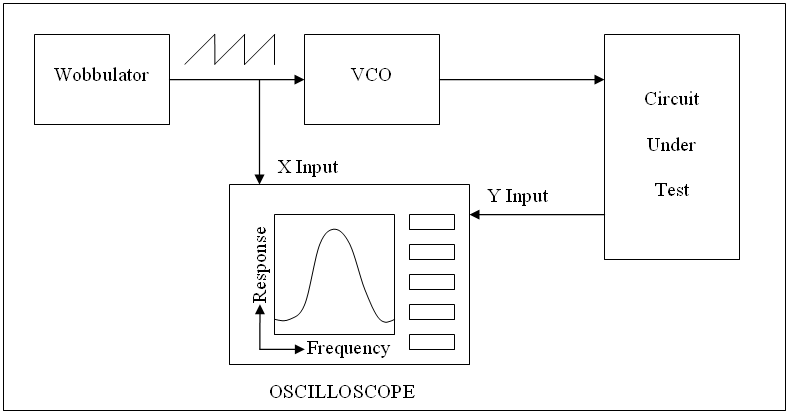 The swept frequency output from the VCO is injected into the circuit under test and the resulting output is fed (via a detector circuit if necessary) to the Y axis input on the Oscilloscope. 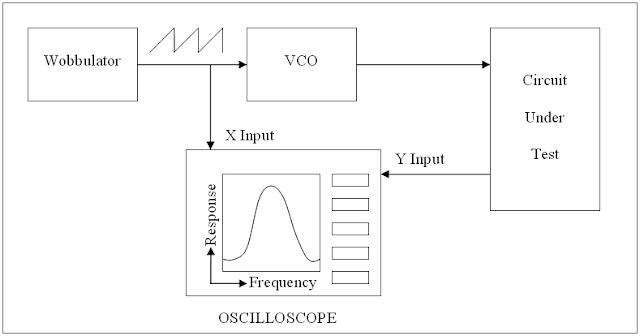 The resulting trace on the Oscilloscope shows the response of the circuit under test over the range of frequencies. The Raspberry Pi Wobbulator achieves the same result by using a Direct Digital Synthesiser (DDS) module to generate the frequency sweep and an Analogue to Digital Converter (ADC) module to “measure” the response of the circuit under test. The DDS and ADC modules are controlled by and communicate with the software running on the Raspberry Pi via a Graphical User Interface (GUI) and the resulting frequency response curve of the circuit under test is be plotted by the software and displayed on the GUI. The Raspberry Pi Wobbulator offers the following advantages over a conventional wobbulator. The Raspberry Pi Wobbulator was developed on a Raspberry Pi Model B Rev 2 (512 MB RAM) running the Raspbian “Wheezy” v7.1 (Linux kernel v3.6.11+) operating system. In my next post I'll explain how the Raspberry Pi is connected to the DDS module in order to generate the RF frequency sweep.